Can you believe that it's been almost 5 years since I started The Skinny Fork? How exciting! 5 years can make such a big difference. I look back at old recipes when I make them again and often end up retaking the photos. 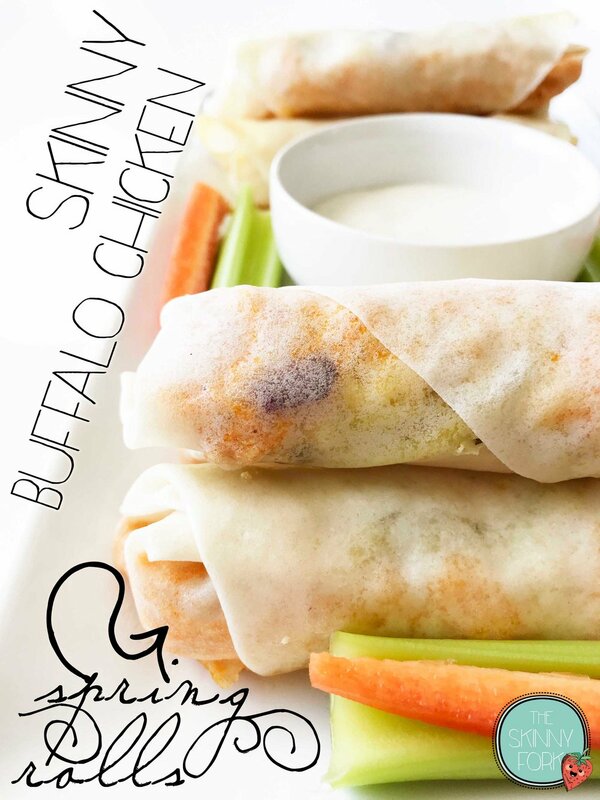 With these Skinny Buffalo Chicken Spring Rolls being one of my favorites, I thought I would go back and blow the dust off and give it a bit of a facelift. As usual, the recipe is the same, though I did add pressure cooker instructions! Here's the original as written! I've been going about this all wrong. I've made buffalo chicken egg rolls about a million times now. And this past week when I was buying some egg roll wrappers, they were all sold out. Of course. Desperate, I asked one of the clerks who mentioned there were some other options in the frozen section. While there I stumbled across some large spring roll wrappers. Fantastic! 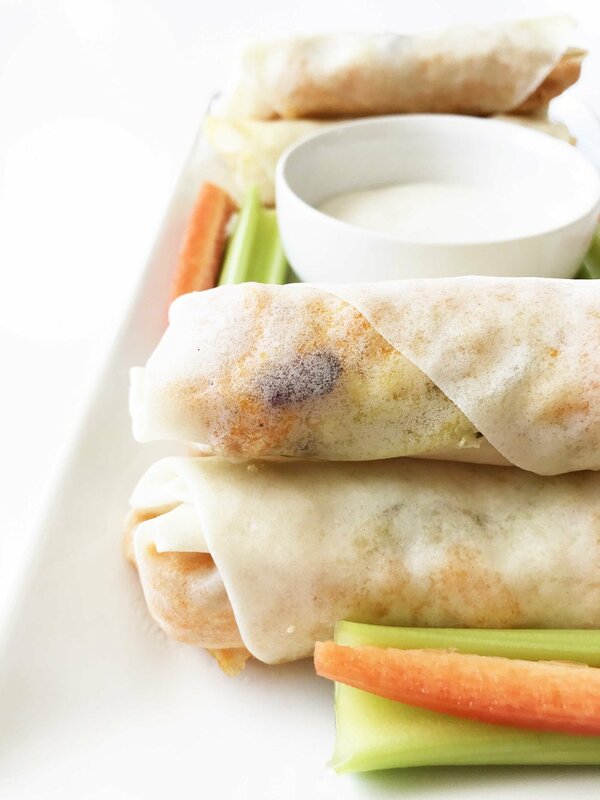 I love spring rolls even more... and what's even better? They were only 20 calories each as compared to the 90 of traditional egg rolls wrappers. That's a whopping 70 calorie difference! That isn't to mention that these come out so light and crispy! Traditionally when I think of a spring roll, I think of a vegetable stuffed mini version of an egg roll. Except that the wrapping is a lot more airy and flakey. 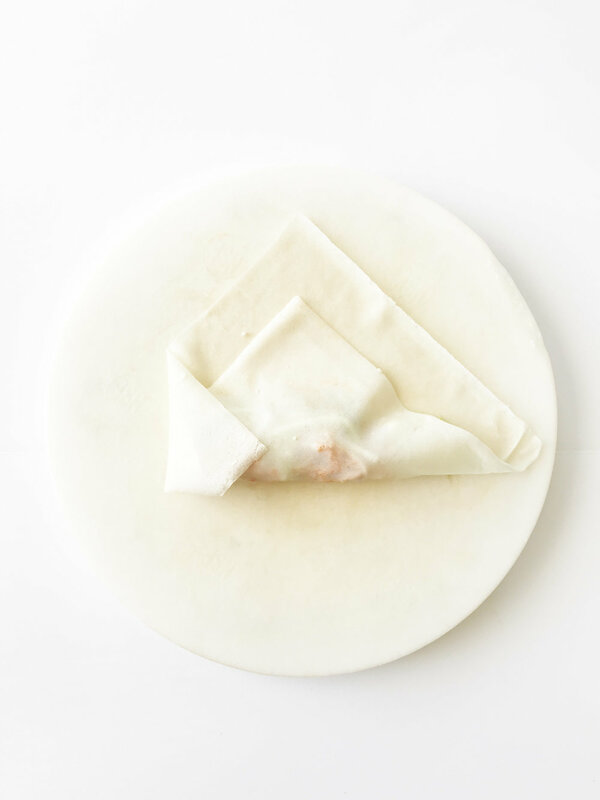 These spring roll wrappers are the size of any standard egg roll, and perfectly perfect for what I had them in mind for! I serve mine with a side of crudete and some light ranch or bleu cheese dressing. And no, I am not secretly judging you if you do not like bleu cheese. Yes, yes I am. I totally am. 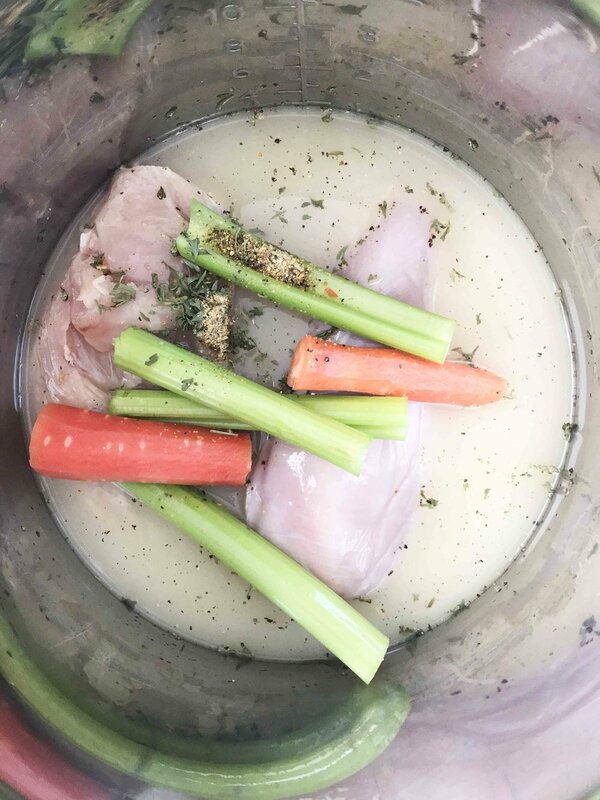 Toss the chicken, broth, veggies, and Dry Ranch Seasoning into the base of a crockpot or Instant Pot. Cover and cook on low heat for 6-8 hours or high heat for 4-6 hours. Seal the lid and be sure the pressure knob is on 'sealing'. Set on 'Poultry' for 40 minutes. Once done, use the instant pressure release by carefully setting the knob back to 'Venting'. I use my stand mixer with the paddle attachment for a minute or two, but two forks work just as well! 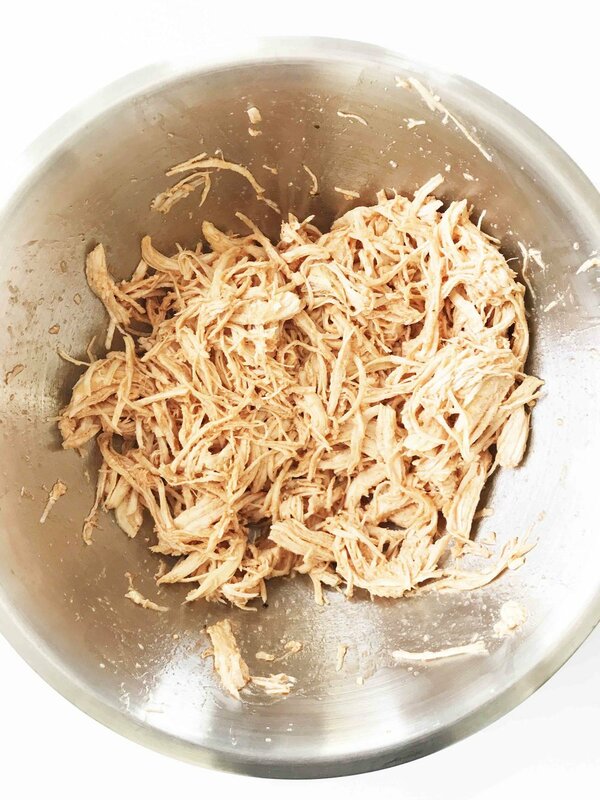 Mix the shredded chicken with the hot sauce until evenly coated. Preheat the oven to 400 degrees F. and cover a baking sheet with foil. Top the prepared baking sheet with a wire rack if you have one and give a light coat of non-stick cooking spray. 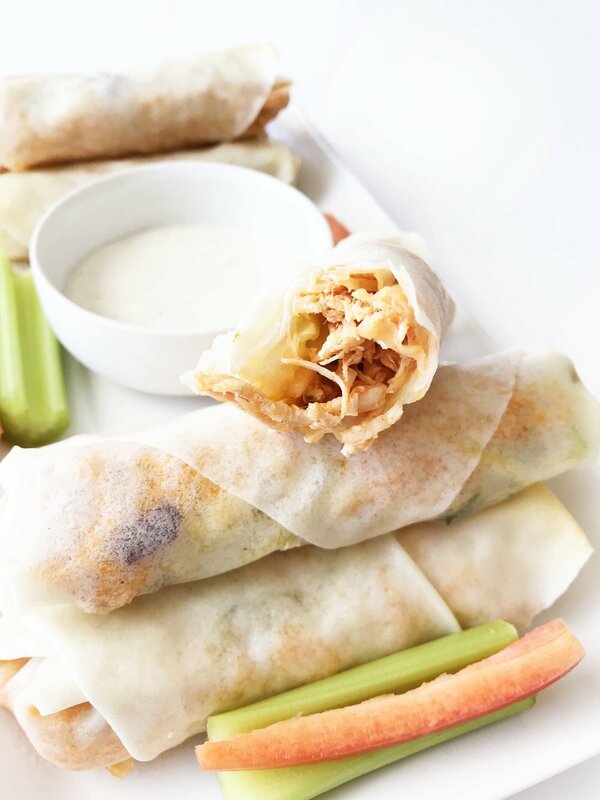 Lay out your spring roll wrappers and fill with about 1/4 C. of the chicken, 2 tbsp. of slaw, and 1/2 tbsp. bleu cheese crumbles. Place onto the prepared baking sheet. Bake for about 10 minutes or until edges are browning and crisp. Remove from the oven and allow to cool slightly. Serve warm!